A local Eugene institution is getting its first major face-lift. 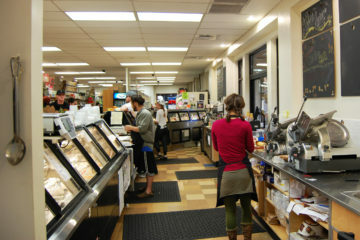 Open for more than 40 years, The Kiva grocery store has served Eugene residents at the corner of 11th and Olive with the idea that everything they sell is healthy and organic. Locally owned and operated since its inception, The Kiva has resided at it’s current location since 1983 and if you’ve been in there, you know the space is certainly quaint. But what they lack in size they make up for in charm. If you’ve ever wanted to know the name of which cow produced your milk or the farm that your tomatoes were grown, The Kiva will tell you. Everyday is casual Friday for their employees and despite only four aisles, the store stocks plenty of meat, produce and wine. The size of the store does factor into the changes being made, but according to owner Melissa Brown, most of the work will be done around the confines of the shopping area. “We’re so limited in this tight little space so we’re not doing anything inside. It’s mostly about trying to rework the existing space and replace some aging equipment that’s less efficient,” said Brown. The major changes to the store will be done on the exterior and will consist of three phases. Phase one will be adding a large window on the south side of the building facing 11th street. That side will also be the location of a new deli area with a walk-up window as well as a covered seating area with tables and chairs for customers. “The Kiva right now has only a front door and a couple of windows next to it and that’s really all that you can see of it so we definitely wanted to open it up and create more of a connection between the outside and inside so there’s a bit more of a celebration of what’s happening inside that’s expressed on the outside,” said Nir Pearlson, architect for the project. The part of the design that will occur inside is phase two. The store will be getting new walk-in coolers, equipment changes in the kitchen and new bathrooms. It was important to Melissa that they not make drastic changes that would somehow alter the existing shopping experience. Pearlson also faced challenges in balancing changes that were to be made while also maintaining the existing feel of the store. Brown is optimistic that the first two phases will be done in early August. The final s section of the project will be to the exterior of the building out front. “There’s a design for the sign out front. Right now we’re focusing on the south side wall and seating area. There is a design for the front entry and the awning. Whether we’ll get to it or not and when we’ll get to it I’m not sure. But there’s definitely consideration for changing that as well,” said Pearlson. But the priority is to finish the first two phases. Work has already begun on the large window and deli area and despite the construction, the store has remained open. Melissa is hopeful the changes will not interfere with the day-to-day operations of the store. “We’re probably going to have two days where we’ll have to close but we’re trying to close as little as possible for financial reasons,” said Brown. Melissa is targeting August eighth and ninth as the days for the large reset (phase one and two) to be finished assuming everything continues as planned. Throughout the entire process of remodeling, Melissa has heard positive feedback from customers and she hopes the changes lead to a better shopping experience. But for now The Kiva operates as if nothing is changing. After 40 years in business, the place deserves a few upgrades. Posted in Commercial, News, Publications and tagged Retail.